The iPad is a great entertainment device and if you aren't having any fun on it then most likely you do not have one of the following games on your iPad. You can argue which games iPad games are the best. Which iPad games look the best. Which iPad games have the best graphics or best story. I don't think a lot of that matters if the game is not tons of fun. A game don't have to look the best to be the best. These games listed below have incredible graphics, sounds and game play. The following games will turn your efficient media consumption device into an exciting and fun gaming device. Hungry Shark Trilogy's title intrigued me, so I tried it. As the name implies, Hungry Shark is all about the quest for food. And while that sounds boring, it’s not. This game has almost everything you could want (as long as you’re not looking to improve your IQ). 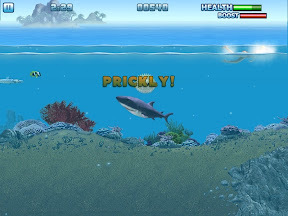 True, Hungry Shark is a bit gory and repetitive at times. But it’s also full of silly puns, requires surgeon-precision skills, and offers just enough incentive to make it addictive. It even helped my shark cowardice. It turns out all I needed was some old fashioned emersion therapy. Sharks are actually semi-cute, witty, and just trying to get by in the harsh world we live in. The game penalizes you for simply eating humans for the fun of it. If the shark is starving, then humans are fair game. The shark doesn't have total control of the situation either, there are plenty of dangers to worry about as the shark, like mines, blow fish, sword fish, etc. This game is tons of fun. 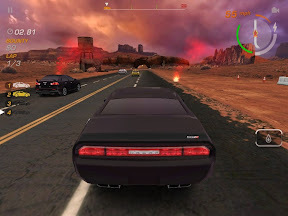 Need for Speed - Hot Pursuit for iPad offer four tiers of races with six events in each. You’ll start off as a rookie cop, and as you earn more achievements and bounty (i.e. money), you’ll get promoted and be given the rights to drive more powerful cars, of which there are a total of fifteen. Through day, night, and dusk, you’ll speed down all sorts of roads and cut across diverse landscapes, from the mountains and desert to the coast. The game offers four main event types. For Interceptor, you’ll have to take down a racer as fast as you can, while in Tough Justice you’ll be working to take down up to three racers. The faster you complete your task, or the more racers you take down, the greater the bounty you will receive. Power Struggle pits you against other cops to demonstrate who’s the best. Finish first to earn three stars and the highest possible bounty. In the fourth type of event, Rapid Response, you won’t have to race against anyone else but yourself, with the goal of reaching your destination as soon as you can. If being on the side of the law isn't your cup of tea, then you can be the racer and have similar challenges on the other side of the law. Believe me, you won't regret either side you choose. There’s Wi-Fi multiplayer compatibility that allows you to play head-to-head against friends on the same Wi-Fi network (and using Bluetooth). 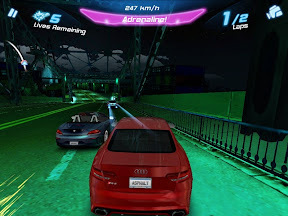 Asphalt 6: Adrenaline HD is my favorite iPad racing game (at the moment). It’s colourful, energetic, stupidly fast and it does very unrealistic things with “real” cars. The different race modes are all fun and eliminating other cars by ramming them at high speed never gets old. The occasional verbal comments are neither soulless pit-crew guidance or overenthusiastic yelling commentators; it’s an amused sounding woman who sarcastically points out that you shouldn’t have wrecked your car, or laughs appreciatively as you smash another opponent off the track. There’s Wi-Fi multiplayer compatibility that allows you to play head-to-head against friends on the same Wi-Fi network (and using Bluetooth). Plus you can challenge folk online via Gameloft Live. For 18 years, no basketball videogame has delivered the same kind of fantastical dunks, memorable catchphrases and arcade-style wackiness as NBA Jam. 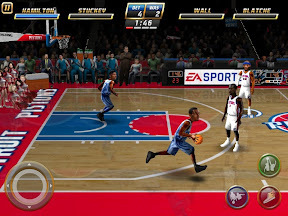 Originally developed by Midway and now published by Electronic Arts, the long-loved sports title has now been optimized for iPad users, complete with updated rosters, spruced-up graphics and the same flair that made the earliest iterations a must-own for any sports game enthusiast. As usual, the game is 2-on-2 basketball and you can switch up your rosters at halftime. Only the best on each NBA roster are included here, but as you complete certain goals and beat specific teams, historical players can be unlocked for the full nostalgic experience. There’s Wi-Fi multiplayer compatibility that allows you to play head-to-head against friends on the same Wi-Fi network (and using Bluetooth). In Angry Mob Games' Guerilla Bob you are this rugged guerilla army guy, ready to shoot up your enemies. You pick up different weapons like machine guns, flame throwers, time bombs and more. You walk in a 2.5D playing field from one end to another without, hopefully, getting killed. You shoot all your enemies, but also structures like tents and gates to get to the end. During levels you get introduced to all kinds of enemies (with a nice, big still) that posses different skills to make your life miserable. The controls are flexible and great, especially with automatic aim. Without auto-aim, I found the game incredibly challenging, with it’s just a lot of fun. This makes it really great to replay levels, first with and then without to sharpen your skills and get trained faster to tackle later levels. This is a great game to play alone, that give me the fuzzy feel of classic home computer games like Commando and Rambo. But it’s even better in multiplayer mode; you can play via WIFI with multiple iPads/iPhones as well as on the same iPad with two people. Together you beat your enemies. You find yourself shooting at your friends to get them to follow the leader and do as your say after only minutes of playing. Teamwork is important to survival, you can even revive a fallen teammate if you can ward off the bad guys to do so. Don't have another iOS device? 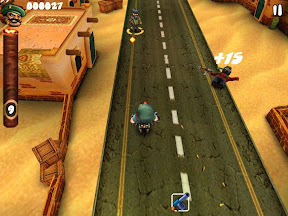 No problem, Guerilla Bob is available on the Android market and it can join in on the multiplayer fun too. As fun as these games are on my iPad 1, I hear that they only get better on the iPad 2. If you don't enjoy these games, you come back and talk to me in the comments. If you have any of these games already, please let me know what you like best in the comments as well.